HIGH QUALITY STAINLESS STEEL: The premium quality grater and zester is made of 304 stainless steel that will not rust. The strength of the metal will ensure that this kitchen appliance lasts for generations to come. It is also anti-corrosive, robust and prone to wear and tear. ZESTING AND GRATING HAVE NEVER BEEN SO EASY: Shear the hardest cheese into grated fluff using almost no pressure. That is, zip the cutter-knife across the rinds of oranges, lemons and limes. In seconds, you can have finely grated garlic or ginger or treat yourself to a favorite dessert topped with fluffy chocolate flakes. EASY TO STORE AND DISHWASHER SAFE: The zester grater has a hole on its handle. You can just hang it with the rest of your kitchen accessories. Blade Cover is also included for safe storage. COOK HEALTHILY: Ingredients such as spices and citrus not only improve flavor, but also provide multiple health benefits. This zester grater is the perfect partner for preparing these disease-fighting herbs on your dishes. LONG SERVICE TIME: The special material, 304 stainless steel and rigorous process give it the high quality. This multipurpose kitchen tool will make your favorite dishes easier than ever before. Perfect for grating Parmesan for your pizza or pasta. 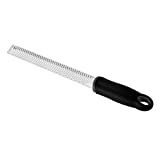 The zester grater has a high quality 18/8 stainless steel blade that will not rust. The non-slip handle is extremely strong and designed for a perfect grip. The protective case has a snug fit that will add even more protection. This zester grater is easily cleaned with a little soap and water. Snap-on cover to protect the blade when it is not in use.